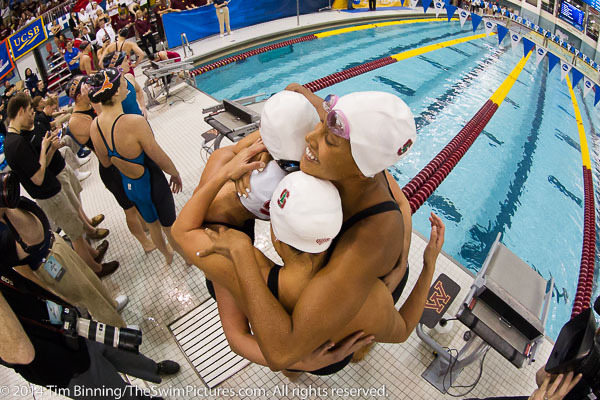 Felicia Lee, Lia Neal and Maddy Schaefer of Stanford celebrate victory in the 200 yard freestyle relay at the 2014 NCAA Division I Women's Swimming and Diving Championships held at the University of Minnesota. 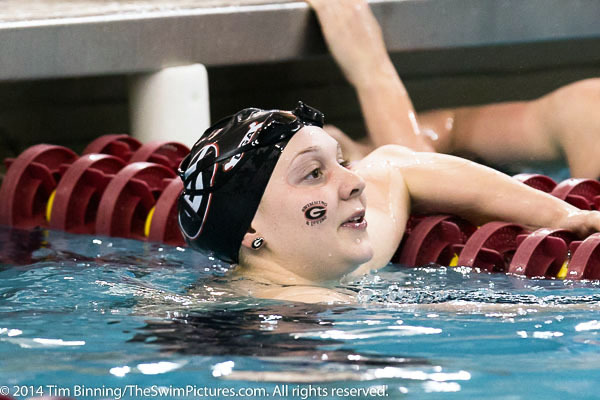 Brittany MacLean of Georgia checks her time after winning the 500 freestyle in an NCAA Championship record time of 4:32.53 at the 2014 NCAA Division I Women's Swimming and Diving Championships held at the University of Minnesota. 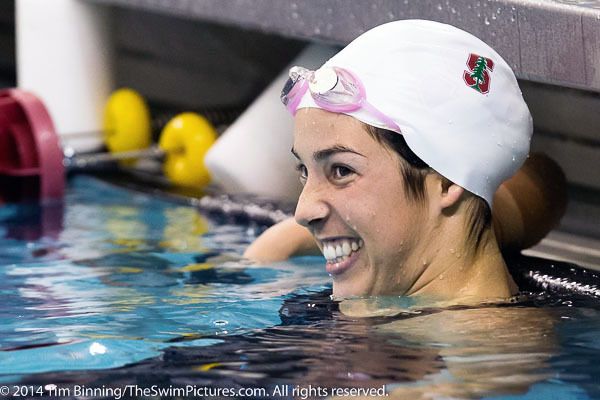 Maya DiRado of Stanford reacts to her come from behind victory in the 200 individual medley at the 2014 NCAA Division I Women's Swimming and Diving Championships held at the University of Minnesota. 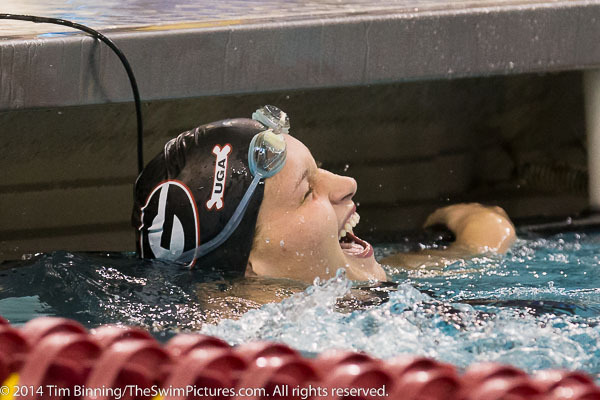 Georgia Freshman Olivia Smoliga reacts to her 50 free win at the 2014 NCAA Division I Women's Swimming and Diving Championships held at the University of Minnesota. 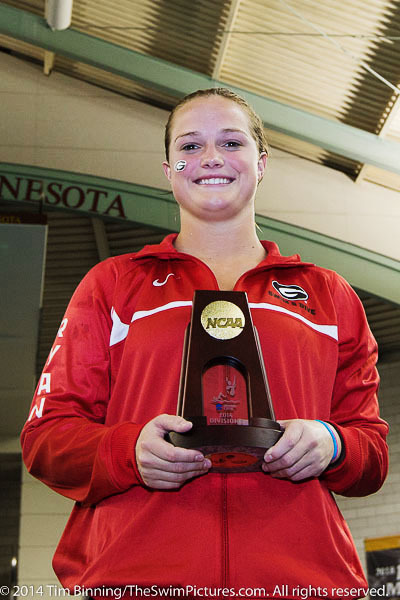 Laura Ryan of Georgia wins the 1 meter diving at the 2014 NCAA Division I Women's Swimming and Diving Championships held at the University of Minnesota. 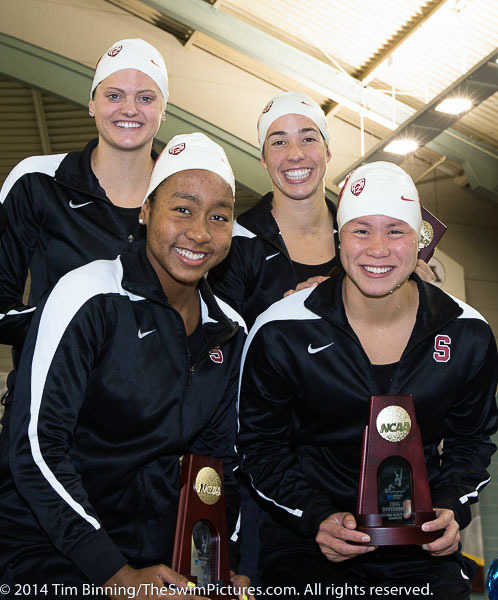 Katie Olsen, Maya DiRado, Lia Neal and Felicia Lee on the 400 medley relay awards stand after Stanford wins its second relay of opening night at the 2014 NCAA Division I Women's Swimming and Diving Championships held at the University of Minnesota. 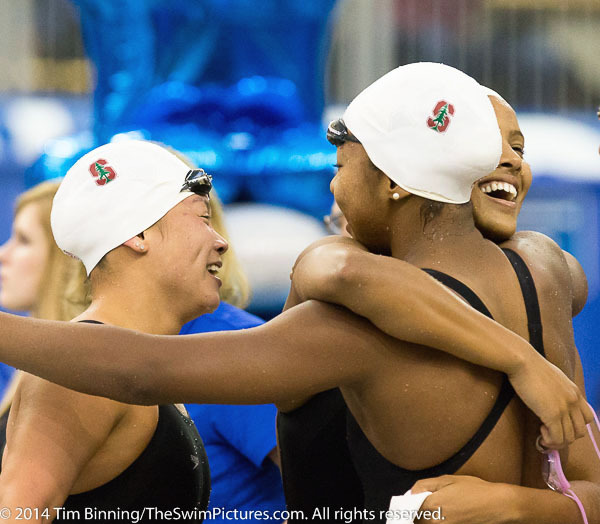 The Stanford women extend their relay winning streak to 3-0 after winning the 200 medley relay at the 2014 NCAA Division I Women's Swimming and Diving Championships held at the University of Minnesota. 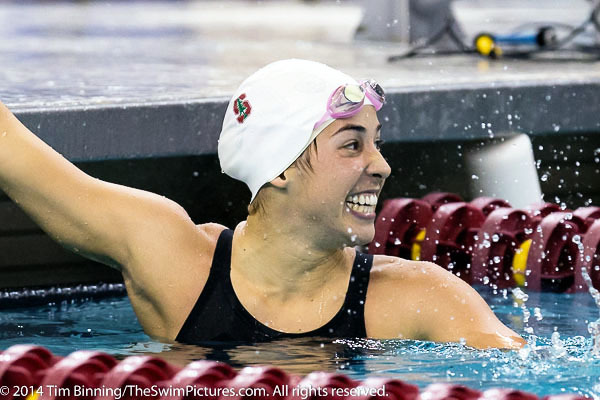 Senior Maya DiRado continues Stanford's winning streak taking the second event of night two, the 400 individual medley, at the 2014 NCAA Division I Women's Swimming and Diving Championships held at the University of Minnesota. 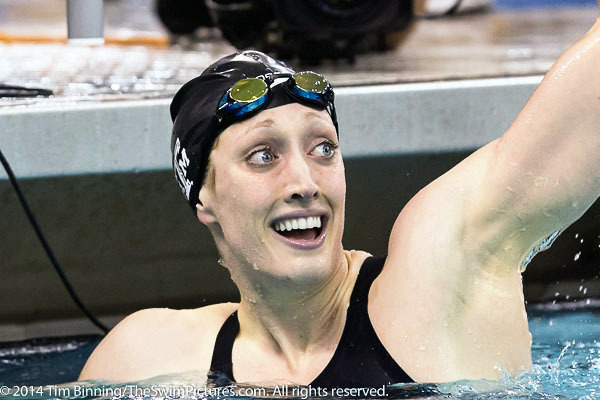 Her victory in the 400 individual medley was also her second individual victory having won the 200 IM on day one. 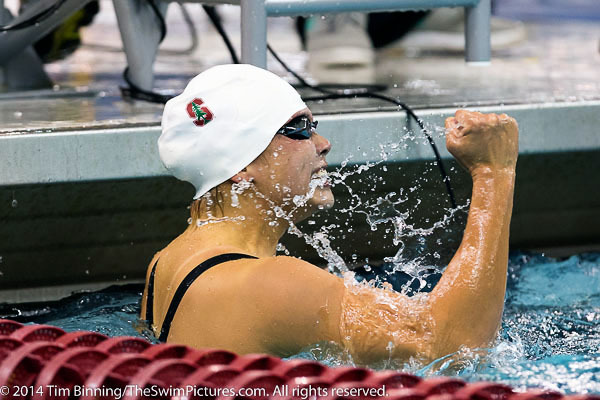 Felicia Lee wins the 100 fly, giving Stanford it's third straight win on night two of the 2014 NCAA Division I Women's Swimming and Diving Championships held at the University of Minnesota. 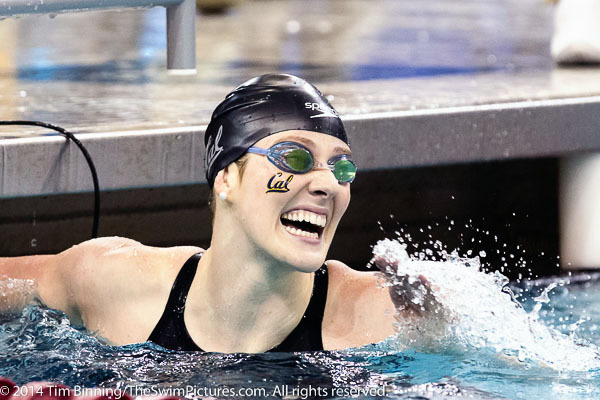 California Freshman Missy Franklin wins the 200 yard free in an American and NCAA record time of the 1:40.31 at the 2014 NCAA Division I Women's Swimming and Diving Championships held at the University of Minnesota. 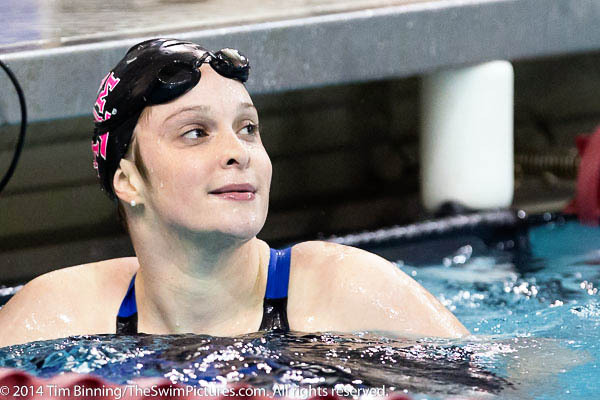 Texas A&M Senior Breeja Larson sets a new American and NCAA 100 breaststroke record of 57.23 in winning the event at the 2014 NCAA Division I Women's Swimming and Diving Championships held at the University of Minnesota. 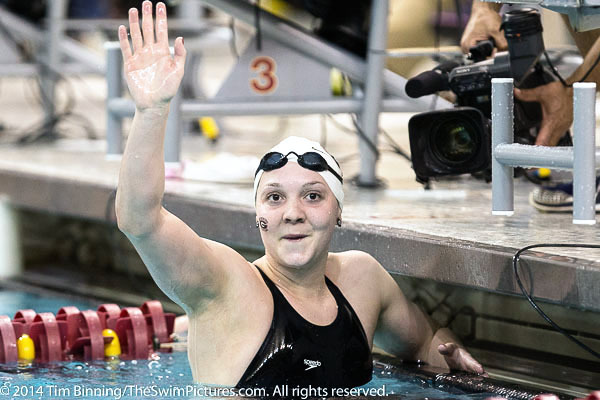 Another Texas A&M Senior, Paige Miller, continues the Aggie winning streak taking the 100 backstroke in 50.77 at the 2014 NCAA Division I Women's Swimming and Diving Championships held at the University of Minnesota. 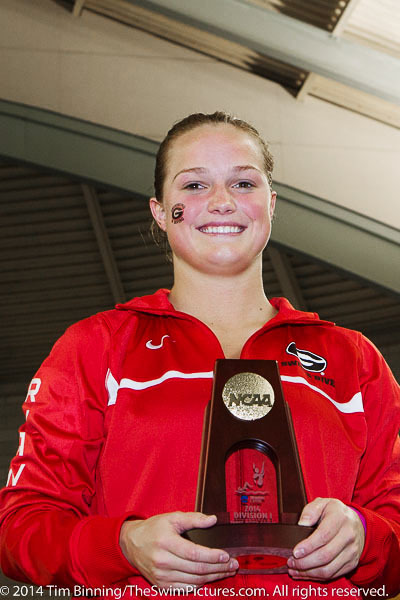 Laura Ryan of Georgia adds the 3 Meter diving victory to her early 1 Meter victory on night two of the 2014 NCAA Division I Women's Swimming and Diving Championships held at the University of Minnesota. 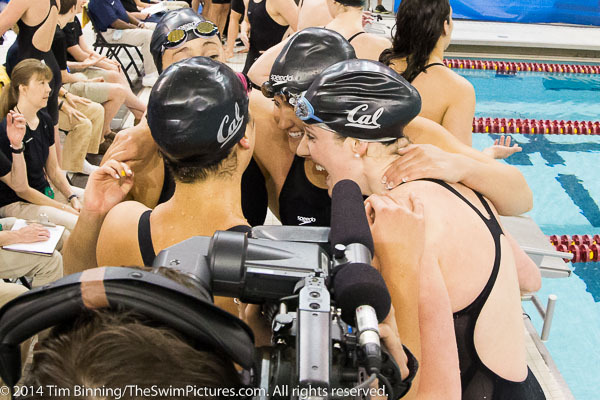 The Cal Berkeley 800 free relay celebrates victory at the 2014 NCAA Division I Women's Swimming and Diving Championships held at the University of Minnesota. 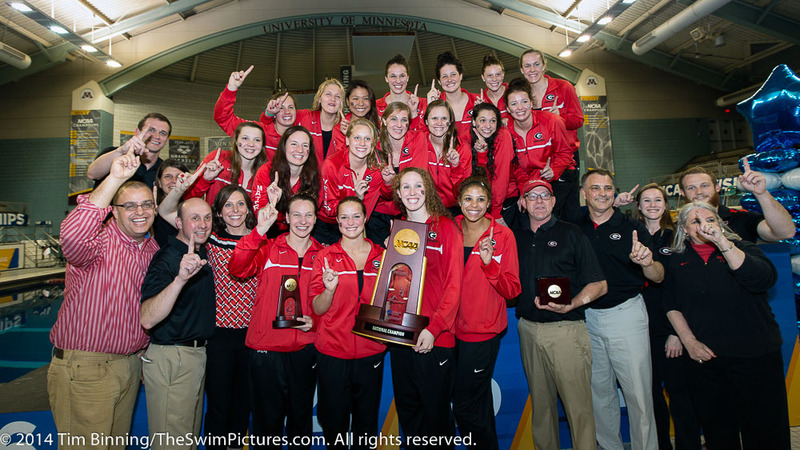 Brittany MacLean of Georgia gets her second win of the competition in taking the1650 freestyle in an NCAA record time of 15:27.84 at the 2014 NCAA Division I Women's Swimming and Diving Championships held at the University of Minnesota. 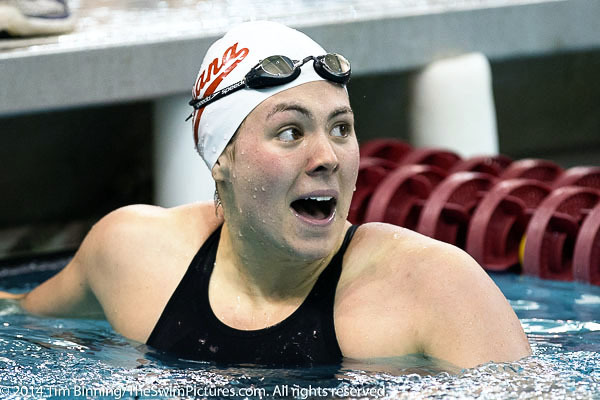 Indiana Sophomore Brooklyn Snodgrass wins the 200 backstroke at the 2014 NCAA Division I Women's Swimming and Diving Championships held at the University of Minnesota. 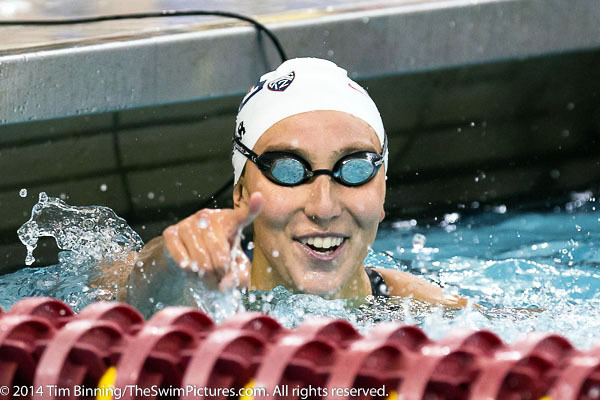 Arizona Senior Margo Geer repeats as 100 free champion at the 2014 NCAA Division I Women's Swimming and Diving Championships held at the University of Minnesota. 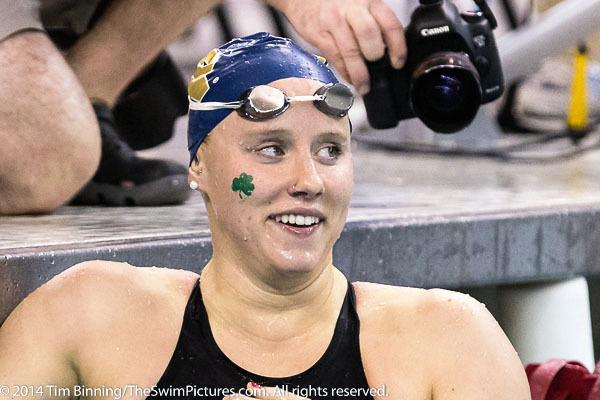 Notre Dame Junior Emma Reaney breaks her own American 200 breaststroke record in winning the event in 2:04.06 at the 2014 NCAA Division I Women's Swimming and Diving Championships held at the University of Minnesota. 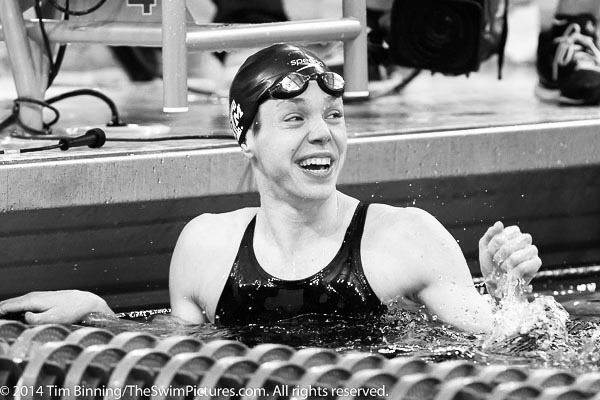 Texas A&M Senior Cammile Adams repeats as 200 butterfly champion at the 2014 NCAA Division I Women's Swimming and Diving Championships held at the University of Minnesota. Haley Ishimatsu of USC repeats as platform dving champion at the 2014 NCAA Division I Women's Swimming and Diving Championships held at the University of Minnesota. 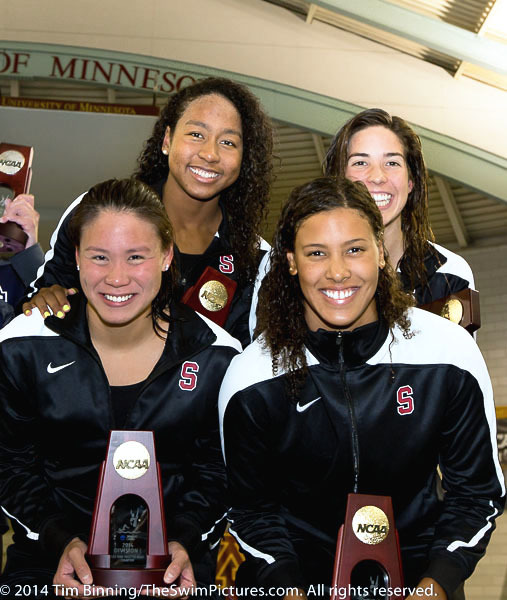 The victorious Stanford 400 free relay team of Lia Neal, Maya DiRado, Felicia Lee and Maddy Schaefer accept their awards at the 2014 NCAA Division I Women's Swimming and Diving Championships held at the University of Minnesota. © Photos copyright 2014 Tim Binning/TheSwimPictures.com. All rights reserved.